Peter spent the first 14 years of his life in the Middle East - a part of the world that still holds a special interest for him. He first listened to the news from the World Service and to BBC plays and comedy programmes on the British Forces Broadcasting Service (BFBS). After dabbling with acting, he joined BFBS as an announcer, and travelled around the Middle East for five years, before coming to London and joining BBC Radio 2. 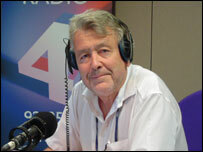 Peter joined BBC Radio 4 in 1974 and has been with the network ever since. He became chief announcer in 1988 and has concentrated on news for the past decade. Other than news and current affairs, Peter's interests include walking -- usually to pubs to discuss politics and religion; and swimming -- sometimes across tiny bays, to tavernas, to talk about Mediterranean cookery and books.